Looking to improve the power, performance, and styling of her 2007 Mustang GT, AM customer Nina came to AmericanMuscle for some new parts. Nina’s 3-valve GT already featured a few aftermarket Mustang parts, like a Cobra style hood, Billet Grille, Track Pack Wheels, and Borla Axleback. Ultimately, Nina wanted to add a little more show, and even more go to her 2007 Mustang GT. Wanting a more aggressive look and handling for her S197 GT, Nina wanted to go with a set of lowering springs for her Mustang. 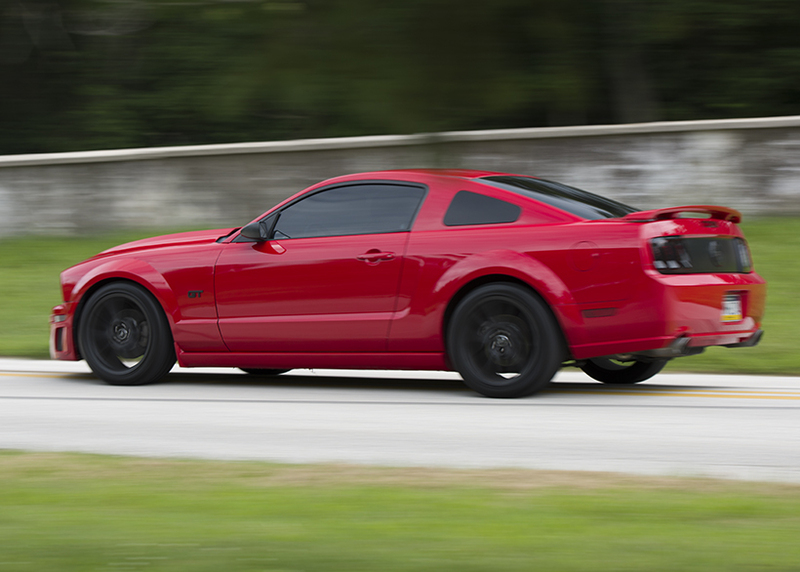 Improving the curbside appeal and performance of her Mustang was possible with the help of SR Performance’s Lowering Springs. With a 1.5″ drop and a progressive spring rate, these springs are the ultimate mix of show and go. Nina also wanted to add a touch of styling to her ’07, playing off of the red and black coloring theme. MMD’s GT350 Style Quarter Window Covers perfectly fit the look she was going for. With an easy, no drilling required install, these quarter window covers helped to give Nina’s Mustang a sleek and aggressive presence in minutes. Nina brought her Mustang to the AmericanMuscle crew with a Borla Atak Axleback already installed. Still wanting a little bit more of a pronounced audio presence, Nina wanted to add Pype’s Off-Road H-Pipe to give her that distinct muscle car rumble. In the process of the install, a rusted bolt happened to break off where the mid-pipe connects to the headers. Instead of just replacing the bolt, the decision was made to replace the factory cast iron headers, with Pype’s Polished Shorty Headers. Cleaning up the engine bay and squeezing some extra power out of the engine, Pype’s Shorty Headers use 304 stainless steel to improve the exhaust scavenging as well as the power. On a stock dyno run, Nina’s automatic 2007 GT threw down 253 RWHP and 268 RWTQ, which is about the average for an auto S197 GT. With the help of C&L Cold Air Intake and a Bama Performance V2 Tune, Nina’s GT got bumped up to 280 RWHP and 286 RWTQ, that’s an addition 27 HP and 18 TQ. Overall, Nina was super pleased with how her build turned out, loving the improved exhaust note, power, handling, and stance. Nina siad, “The car feels really smooth, I’m really impressed with how it turned out.” Being the Mustang enthusiast that she is, I’m sure we’ll be seeing more of Nina in the future!